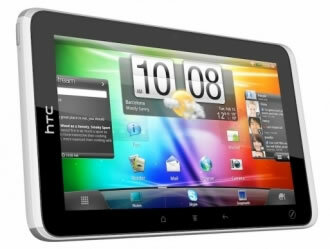 HTC will lower the price of their Flyer tablet to $299 starting tomorrow. Best Buy will be the first to offer the $200 price reduction on the HTC device that launched in May. The HTC Flyer touts a 1.5GHz single-core CPU, 1GB of RAM plus 32GB of flash storage, an aluminum unibody construction, and 1024x600 resolution. It comes bundled with Android 2.3 Gingerbread rather than the tablet-specific Honeycomb found on most newer slates. Slow tablet sales and HP’s decision to discontinue and slash prices on remaining TouchPad tablets has seemingly opened the doors for other manufacturers to bring forth their own price cuts. Earlier this month Fusion Garage discounted $200 off the price of their upcoming Grid 10 tablet. The Wi-Fi only model now has a price tag of $299 while the 3G version can be yours for $399, although the release date has been delayed due to new Flash 10.3 certification processes. RIM recently gave the green light on a second wave of BlackBerry PlayBook price cuts. The $200 discount at select retailers brings the price down to $299 for the 16GB, $399 for the 32GB and $499 for the 64GB tablet. The most recent tablet news is Amazon’s Kindle Fire tablet launch a few days ago. At $199, the Fire significantly undercuts Apple’s iPad 2 which has a starting price of $499 and even the price-cut $299 tablets mentioned above. Fire pre-orders are being taken now with units shipping on November 15.